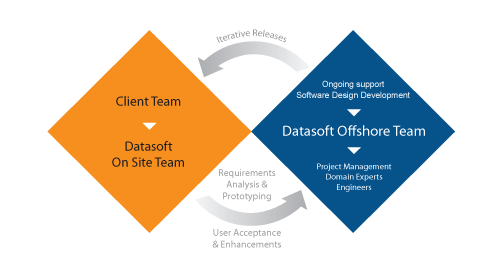 Datasoft provides its clients an incremental engineering model which creates continuous transparency between the client and the developing solution. This ensures that the delivered product is precisely what is required. Our domain experts and dedicated engineers will work closely with clients to create a development charter using proven internal development methodologies which are all process-driven and feature-driven. Our clients constantly have clear visibility during development phase and combined with iterative release cycles, deviations are trapped immediately. Furthermore, there is always an open channel for live feedback and continuous improvement. Our experienced deployment team and proven training tools allow clients to easily take delivery; clients quickly are able to realize immediate and long-term gains from their application development projects. Datasoft has become a leading provider of enterprise-class software solutions by investing in leading edge technologies. Our teams of .NET experts have a deep background in web-based, desktop and truly n-tiered applications. We boast tremendous experience in databases and mobile computing applications.